La Mer The Moisturizing Cream .24 oz Crème de la Mer NEW! divasuppliesstore has no other items for sale. La Mer The Eye Concentrate 3ml New in Jar Guaranteed Authentic & Fast Shipping! 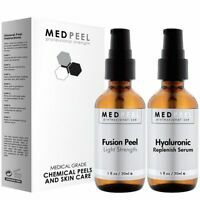 MedPeel Fusion Peel - NEW! 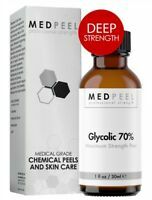 Special blend of Salicylic and Glycolic Acid! If you have the money to spend La Mer has some really great products. If I could afford it I would only wear La Mer products. The cream is great for dry skin, but make sure you warm it up by rubbing it between your fingers before you apply it. If you don't have the money to spend on all of the La Mer products I would suggest buying this moisturizing cream if you have to pick just one thing from their line. Save your money, product and size not worth it! This isn't "travel size" more like pick up at Macy's or the like free sample-not worth paying for. As for the product itself, it is not as rich as the original La Mer and can only liken to ponds or the like. Definitely save your money on this one-not worth it on any level. You can see photo of it next to a small cream pot I have so you can see nickel amount. I've been using La Mer moisturizer for at least five years and highly recommend it. 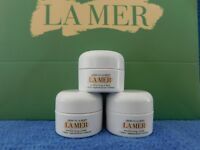 Though it's quite pricey, I've always found great deals on all La Mer products on ebay. I find this cream perfect for dry skin. Rub it between your fingers to warm it; then pat all over face. This moisturizer has really done its job and people swear I look ten years younger than I really am! La Mer is one of the reasons why. (Lots of water and good sleep also help) I highly recommend this product. My wife likes it. In my opinion, its not worth th $200 for a little two ounce jar. Good marketing for sure, but it seems to me you could get the same results with regular gels you could get for $10. I have yet to see any real scientific results that it or any of the creams really work. The only thing would be to get younger!!! In any case, a happy wife is a happy life. When using this moisturizer, my make up glides on....my skin has a glow that none other moisturizer can give. It is a good wrinkle fighter also. Couldn't live without it.